No question, it is miraculous to bring dead back to life, make the blind see again, and feed five thousand people with two loaves of bread and two fishes. But what has happened with Meadowcreek football under Coach Carrera this season is close to being as equally miraculous, if you will excuse a bit of hyperbole, say those who realize that for the first time in 28 years, the Mustangs are assured of a winning season, even if they fail to win another game in 2017. 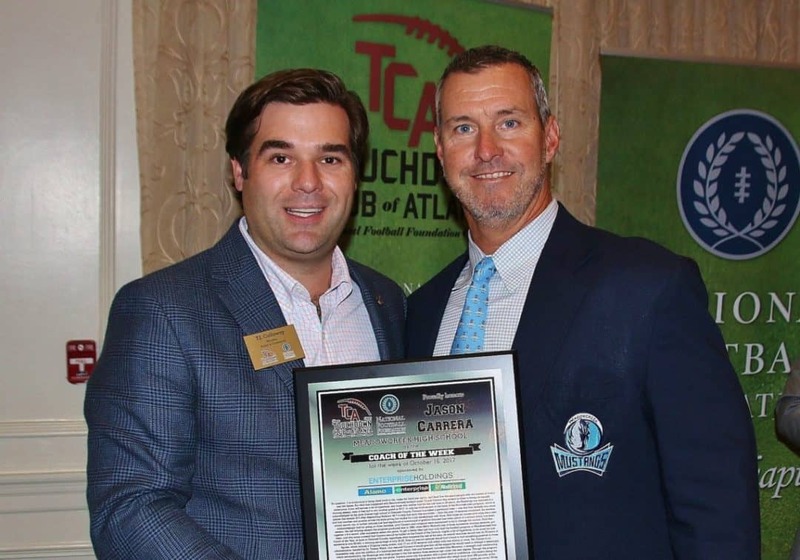 In only his third season at the helm of the Norcross area program, which is acknowledged as the most diverse high school in Gwinnett County, Carrera has taken a perennial loser — one that has already won more games this season (6-0 after dispatching Berkmar 48-7 to help him earn this accolade) — than the past 13 seasons combined, for starters, and has coaches and pundits across the state giving him kudos for a job exceedingly well done. company were summoned to try to change the culture. Until this season, the last winning season the program produced was in 1990, when Kevin Maloof’s last of three successive winning seasons, put together a 6-4 record, after successive seven-win years. only 62-245, a winning percentage of only 20.20. Even an eternal optimist would find it hard to find something positive in those figures, which include a 53-game losing streak, and 17 out of 20 seasons with either only one victory or none. Yet, thanks to an administration, headed by Dr. Tommy Welch, that assured Carrera it would give him all the support he would need to attempt a seemingly impossible task, plus the addition of a hand-picked staff, which, first and foremost, included John Mannino, a strength and conditioning coach extraordinaire, the Mustangs won three games in the first season three seasons ago under the new regime. While much credit goes to Mannino and his athletes, who proudly hail themselves as “Mannino’s Maniacs,” for their commitment in the weight room, an a nutritional program that has paid major dividends, a couple of other factors – offensive line coaches Roy Goshek and Chester Adams, who have made the Mustangs significantly tougher in the trenches, have greatly contributed to the program’s success and scoring 40 points a game, fifth best among all programs in Class AAAAAAA. Carrera, who had two seasons as a head coach at Flint River Academy, a GISA program, where he put together a 7-4 and an 8-4 record his two years (2012 and 2013) there, is the 12th head coach in Meadowcreek football history, and yet he needs only one more victory (11) to move into the slot as the second-winningest football coach all-time, and only 10 behind Maloof, who left the program after five years with a total of 21 wins. Speaking of one more elusive victory, Meadowcreek needs only one more win to ensure its first state-playoff berth, or postseason berth of any kind since 1988.